NBC SPIRITUALLY HOLLOW. At its best, the Olympic movement represents to me the highest of ideals and considerable hope for increasing understanding, goodwill, and healing among nations. I just don't know if these are being served at the Beijing Olympics. The images and stories that are presented on TV and online have no focus on the athletes' cross-cultural mingling or bridge-building conversations, encounters, and exchanges. If these are occurring (and I hope they are), you wouldn't know it from NBC's vast multi-media, 24/7 coverage. Technically, NBC has done well. Spiritually, they're hollow. INDIVIDUAL STORIES INSPIRE. Individually, the stories of some of the Olympic athletes are gut-wrenching and inspirational. Even without winning a medal, the accounts of dedication and achievement of athletes who emerge to compete at an international level are laudable. They are heroes and heroines of their generation. One of the "lost boys of Sudan" is running as an American sprinter. Families have mortgaged homes again and again to get their gifted child athlete the training to compete. A second generation immigrant Latino wins wrestling gold and tearfully wraps himself in an American flag. We've heard a few of these stories via NBC and I'd really like to hear more, particularly about non-American athletes. SHADOWS BEHIND THE SPOTLIGHT. There's a sad and tragic shadow that is being cast by the Chinese Olympic spotlight. No doubt, China has put its best foot forward and everyone is impressed with what they've achieved. But refused-to-be-answered questions, overt denial, and persecution of political and cultural dissenters will define the memory and diminish the legitimacy of the Beijing Olympics. What is presented in the limelight is at the expense of people whose voices have been muzzled, whose rights have been denied, and whose lives have been taken. China's rank and file have sacrificed those who cry out for freedom and democracy to their gods that promise them legitimacy and prosperity. The fearful silence of China's 1.3 billion ordinary citizens is a compromise of integrity that poisons their future. WILL OUR ATHLETES BE HONORED AT HOME? The closing of the Olympics will bring champions home. Will we hear about the winners of the 36 American gold medals or the many silver and bronze medalists? Will there be a national homecoming, ticker-tape parades, news media specials to follow up their achievements? When Bruce Jenner won the Decathlon as the world’s greatest all-round athlete a generation ago, he was on Wheaties boxes and TV specials. 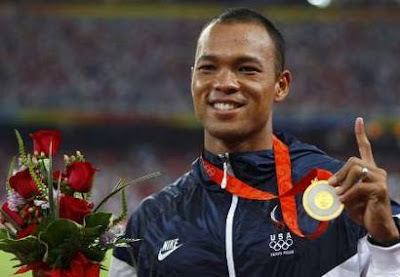 Do you know the name of the American athlete who just won the Decathlon in Beijing ? Will Bryan Clay (pictured) know anything of the enduring honor we’ve shown in the past? I’m wondering.